KANNAPOLIS — Tickets for the inaugural Kannapolis Wine Festival are now on sale, but you better hurry because there are only about 300 tickets for sale. 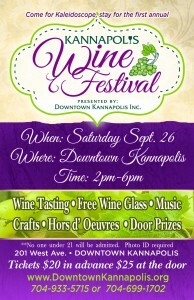 The Kannapolis Wine Festival will be held from 2 p.m. to 6 p.m. at the Old Cabarrus Bank Building at 201 West Ave., Kannapolis. Tickets are $20 in advance and $25 at the door. The festival is being organized by the volunteer organization, Downtown Kannapolis Inc. (DKI). Brenda Drye, with DKI, said they are planning to have at least six wineries and they have confirmed three including Salisbury’s Cauble Creek Vineyard; Concord’s Cougar Run Winery; and Kannapolis’ own Douglas Vineyards. 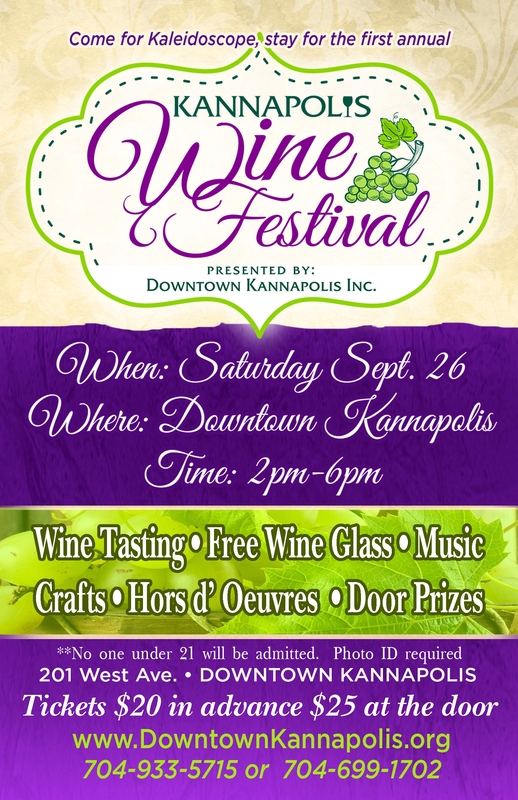 The wine festival will run in conjunction with the Sept. 26 Kaleidoscope Cultural Arts Festival, which is a street festival organized by Kannapolis Arts, a division of DKI. The street festival runs along West Avenue and patrons from the wine festival will have an armband that lets them leave the bank building to participate in the arts festival and then go back for more wine. It is free to attend the street festival. Kaleidoscope Cultural Arts Festival runs from 12 p.m. to 4 p.m. Saturday, Sept. 26 and will have food trucks available thanks to Greg Helmandollar, also known as MasterBacon, who organizes the Cabarrus County Food Truck Friday series. · First Bank, 421 S Main St., Kannapolis. · Atkinson Family Eye Care, 608 Jackson Park Road, Kannapolis. · Omega Graphics, 293 Brookdale St., Kannapolis. · Tickets will also be available at the Downtown Kannapolis Inc. tent at the Kannapolis Cruise-in which runs from from 3:30 p.m. to 9 p.m. Saturday, Sept. 12 in downtown Kannapolis on West Avenue. · Tickets will also be available at the next DKI meeting, which is open to the public. DKI meets again at 6:30 p.m. Sept. 17 at Kannapolis Rotary Hall, 211 West Ave., Kannapolis. · You can also call 704-933-5715 or 704-699-1702 for more information about the wine festival. Visit http://downtownkannapolis.org/ for more information on Downtown Kannapolis Inc.
Visit www.KannapolisArts.com for more information on Kannapolis Arts and the Kaleidoscope Cultural Arts Festival.